Recent back-to-back wins have seen Morecambe begin to put some much needed daylight between themselves and the bottom two in League Two. However, Jim Bentley’s side then defeated Yeovil 4-3 at the Globe Arena thanks to a last-minute winner from the evergreen Kevin Ellison and followed that up with an impressive 2-0 triumph at Grimsby. Although held to a 1-1 draw by Stevenage last week, it stretches their unbeaten run to three matches and means that with seven points from nine, they have elevated themselves up to 19th place, six points clear of that dreaded dotted line. The Shrimps have struggled on their travels so far this season, winning just twice, that at Chesterfield and Grimsby, although five draws from their 13 matches shows they are no rollovers. They have proved more than a match for the promotion chasers at times too, with wins over Coventry and Wycombe as boss Bentley is satisfied with his side’s recent form, saying: “The positive I take from it (Stevenage draw) is that it’s seven points from nine. “We’re on a little unbeaten run and we’re scoring goals but I’m disappointed that we haven’t kept a clean sheet. So far, Morecambe have kept their powder relatively dry during the transfer window, extending the loan of central defender Max Muller from Wycombe Wanderers until the end of the season. The 23-year-old joined the Shrimps in August, with the deal initially due to run until the end of January. However, Morecambe did allow attacking midfielder Elliot Osborne to return to parent club Fleetwood Town after completing his loan spell, while Rhys Turner signing for National League North side Stockport County until the end of the campaign. Team news: Luton expect to have leading scorer Danny Hylton back after he missed last weekend’s 2-0 defeat to Chesterfield with a tight hamstring. Luke Gambin is likely to miss out with a leg injury, while Alan Sheehan sits out the final game of his three match ban, with Alan McCormack and Scott Cuthbert still absent. Morecambe will travel with a fully-fit squad as long as Callum Lang recovers from an ankle injury sustained against Stevenage last weekend when he had to be replaced at half time. Top scorers: Hatters: Danny Hylton (17). Shrimps: Kevin Ellison (8). Man in the middle: Trevor Kettle – second game involving the Hatters this season after officiating the 0-0 draw at Crawley back in October, controversially booking Alan Sheehan for what appeared a clear dive by a home attacker. Refereed 25 games so far, with 93 yellows and five reds, two of those coming in his last three games. Had Luton three times last term, the 1-1 draws with Exeter and Cheltenham, plus a 2-1 win at Leyton Orient. In charge of two Hatters matches in the 2015-16 campaign, with Town winning 3-2 at Oxford United and losing 1-0 at home against Bristol Rovers. 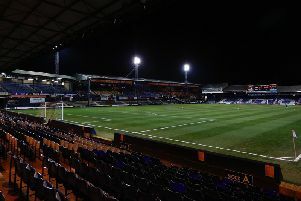 Infamously sent off Sol Davis in Luton’s Championship 0-0 draw at Stoke City in February 2007, and has had seven more Luton fixtures in his career, with wins over Leyton Orient, Wrexham, Sunderland and Tranmere, plus defeats to Plymouth and Stoke City and a draw with Bradford City, when he dismissed Chris Martin. In charge: Jim Bentley, 41-year-old who was with just two clubs during his lengthy playing career, AFC Telford and Morecambe. Began at Telford in 1997, making over 150 appearances, moving to the Shrimps in 2002 and turned out a remarkable 328 times for the club. Was appointed player coach at Morecambe in June 2010, before becoming manager in May 2011 and is now the third longest serving boss in the country, behind Arsenal’s Arsene Wenger and Exeter’s Paul Tisdale. View from the opposition: Jim Bentley talking to the Morecambe Visitor: “There is no pressure on us for this one – it’s all on them. “I’m looking forward to the challenge because no one will give us a chance. “However, they aren’t on a good run and have lost a couple recently against Port Vale and Chesterfield. One to watch: Kevin Ellison. You can’t really look past the vastly experienced striker, who despite being 39 next month, is the club’s top scorer with eight goals in all competitions. Netted three in his last three games, including a last-gasp winner against Yeovil as is showing absolutely no signs of slowing down. Started life at Conwy United back in 1998 and has had a career that has seen him transferred for fees over 200k with spells at Hull, Leicester, Stockport, Chester and Rotherham, to name just five. Joined the Shrimps in 2011 and recently made his 300th appearance, netting an impressive 77 goals in that time. Played for both: Jason Walker - striker who began his career at Greenock Morton, before a short spell at Morecambe in 2007, playing five times, as he then went to Barrow. Impressed for the Bluebirds enough to be snapped up by Luton in November 2010 and went on to score six goals in 29 games for the Hatters, although missed from the spot as they suffered a penalty shootout defeat to AFC Wimbledon in the 2011 Conference play-off final. Headed to York City, where he incurred the wrath of Town fans for his celebrations after the club beat Luton in the play-off final at Wembley and his career has since stalled somewhat. On leaving the Minsterman, he played for Swedish side Osterunds FK and then Forest Green Rovers, returning to Barrow in July 2014 where he spent two seasons. Went to Chorley in National League North in August 2016, bagging six goals so far this term. We’ve got form: Hatters have put a tough start to their home fixtures against Morecambe behind them by winning their last two matches at Kenilworth Road. They began with a 1-1 draw in December 2008, when Michael Spillane’s 51st minute strike was cancelled out by Danny Carlton just six minutes later. Luton were then beaten 3-2 in March 2015 after falling 2-0 behind to goals from Jack Redshaw and Laurence Wilson. Cameron McGeehan’s header saw Luton halve the deficit by the break and Alex Lawless looked to have rescued a point, but Morecambe, who played the last 10 minutes with 10 men due to Ryan Edwards’ red card, won it as Luke Wilkinson turned Kevin Ellison’s cross through his own net. Town did get their first victory on home soil over the Shrimps the following campaign, triumphing 1-0 through Jack Marriott and then won again last season. Last time out: Jack Marriott’s late double ensured the Hatters triumphed 3-1 over Morecambe at Kenilworth Road last year. Isaac Vassell had put Town in front on 28 minutes from close range, before Michael Rose’s penalty just before the hour made it 1-1. However, Marriott came off the bench with 18 minutes to go and swiftly set about deciding the game, with strikes on 74 and 86 minutes to seal victory. Hatters: Stuart Moore, James Justin (Stephen O’Donnell 63), Dan Potts, Scott Cuthbert, Glen Rea, Olly Lee, Jake Gray, Pelly-Ruddock Mpanzu, Luke Gambin (Lawson D’Ath 78), Isaac Vassell (Jack Marriott 72), Ollie Palmer. Subs not used: Craig King, Akin Famewo, Jonathan Smith, Zane Banton.